I have always been fascinated by Tibet, whether it's their magical monasteries, monks, quaint natural beauty, dignified Dalai Lama, ethereal Everest or their simple delish cuisine. When a friend of my mentioned about this hidden gem, I could not stop myself visiting it. In art affectionate Wesleyan's home, Middletown, yes Tibetan Kitchen, Middletown, CT is a tiny piece of an art in its own way. Scarlet walls with Tibetan accents like Buddha and delightful portrait of Dalai Lama brought little Tibet inside this charming place. A little dream of mine became a reality as we entered into this Tibetan Kitchen with a vintage yet cherry, warm yet humble, eclectic oriental casual space. After a hearty and speedy greeting, we were seated. As going through the menu, we switched it a bit. As a momo(dumpling) lover, even though it is in the main course; we chose Momo as a starter. 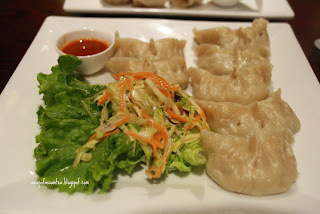 I and my husband had vegetable momo(Tsel momo) and for the kids chicken momo(Sha Momo). Veg momo was a knockout at the first bite, with luscious vegetables inside and with softened cover outside. It was served with a bed of healthful salad(Dhang-tsel) and for dipping, a red hot sauce. Chicken Momo was delicious too, but veg mom was a clear winner. 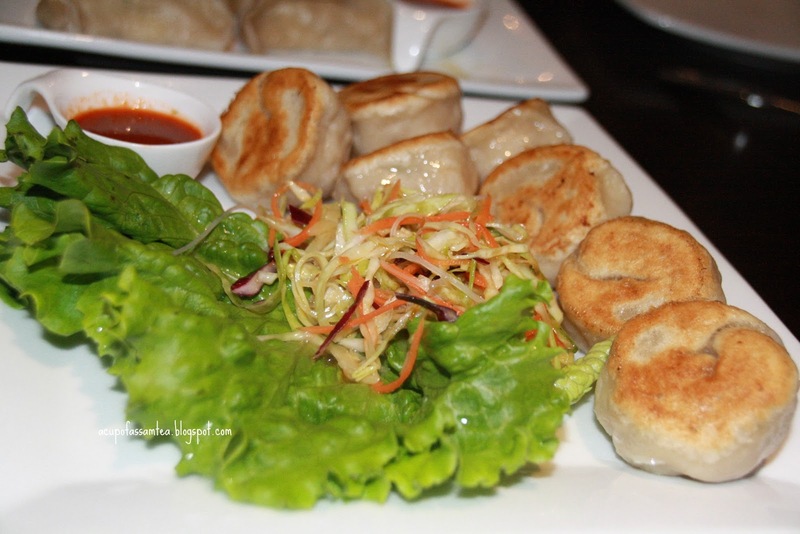 As for momos, you have an option of either steamed or pan fried. I preferred the steamed one because I found it more succulent in comparison to the pan friend one. The food was very flavorful but not to the point of very harsh for your taste buds; they offer the choice of individual spice level as well. For our main, we opted for Noodles and Tibetan bread because we have not tasted either before. The Tibetan bread(Shogo Ngopa) comes with a layered bread and potato gravy with Spinach and Tomatoes. 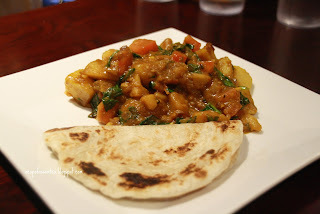 The bread pretty much resembles Indian Lassa Paratha, and the potato gravy is similar to Indian potato curry with the lovely addition of spinach and little chunks of tomatoes. The noodle(Tsel-Gyathuk Ngopa) was simple yet quite different from Chinese or Thai take. The raving part was the freshness that oozes with a slightly spicy taste, fresh vegetables(celery, carrots, cabbage, spinach), and chunky, succulent tofu. As soon as dessert menu arrived, my kids were excited to order Gulam(Cheese balls in sugery syrup) Jamun. It was as sweet and plum as Indian Gulab Jamun with a dash of coconut flakes. Tibetan Kitchen menu was easy to follow with a generous serving at a reasonable price and great options for vegetarian as well. An evening ended with charm, warmth and delicious food. This looks delicious! 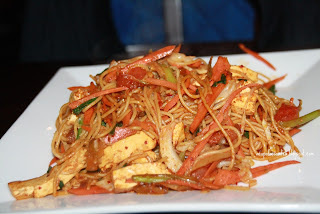 I love trying new and exotic ethnic dishes....Next time I am in CT visiting my family I will have to check it out! Sure. Thank you so much for reading ! Sure please do try. Thank you Alison ! 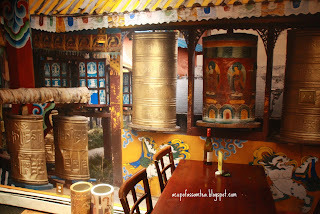 I have never had Tibetan food but have been longing to have good one. I would rather try at a good restaurant than be disappointed. This surely look like a great choice. Please do try. Thank you so much Sona! Sound delicious. I wish I can taste it, but let me know, here there is a soap name as Tibet, so what should I ask some one to cook for me? Sure please go ahead. Thank you so much! Everything looks amazing here. I have never tried Tibetan food before and I would love to. I like experimenting with different foods. Yup. Do try when get chance. Thank you so much! Omg all this food looks absolutely scrumptious! 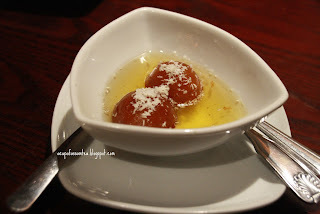 I love Gulab Jamun so I know id love the Gulam Jamun especially if it has coconut flakes. I like the pictures and food too. I have never had Tibetan food before, but it does look delicious. Will have to hunt for a restaurant here in London.